On Saturday, October 20, from 11 am – 6 pm (rain or shine), Aikido’Ka members will be at the corner of Broad & Union Streets for We Can Drive Through 2012. This will be the 5th Annual Aikido’Ka food drive for the Food Bank of Nevada County. Drive Through is an amazingly easy and effective way for you to support the Food Bank and our community. Clean out your pantry and drop off your extra non-perishable food items at the corner of Broad and Union Streets in Nevada City. Just pull in on either side of the street, drop off your cash and/or food donation and drive away. We will be there rain or shine. It’s that easy! I spoke with folks at the Food Bank on October 11. They emphasized how important this food drive is to them. In essence, by this time of year, the Food Bank is broke. They need to begin purchasing food for the big holiday season, but they really don’t have any money. They also have practically no food. Drive Through is their first significant boost going into the season. They said that Drive Through is critical to their success. In early October 2007, we learned that the Food Bank was experiencing a tremendous increase in demand and had been running out of food. In fact, the Food Bank inventory was down to one case of cans. When the Food Bank runs out of food, children go hungry. In emergency response, Aikido’Ka held We Can Drive Through. 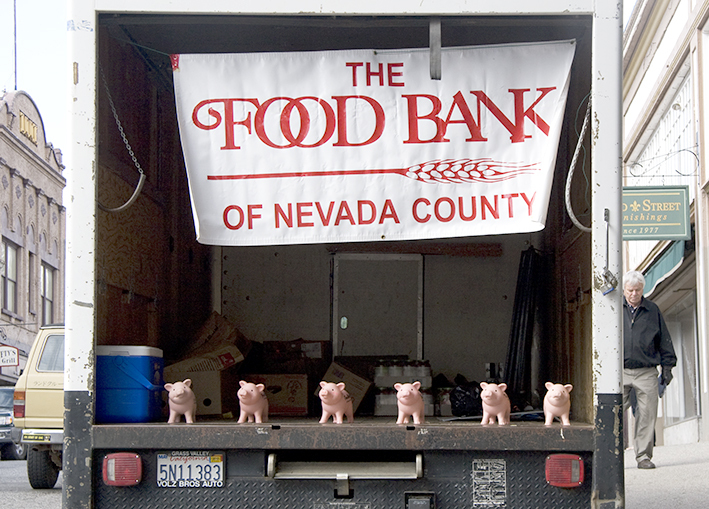 On October 27, 2007, at the bottom of Broad Street in Nevada City the community raised approximately $2,500 in cash and over 1,600 pounds of non-perishable food. With We Can Drive Through, Aikido’Ka has raised approximately $11,000 and 5,750 pounds of food for the Food Bank! The Food Bank does necessary work in our community and needs our support. The Food Bank provides food to senior citizens, single parents, working poor, families and homeless in our county. They are serving more families than ever before, on a budget made up of 80% donations. Please help us make this the most successful We Can Drive Through that we’ve had! Aikido’Ka food drives for the Food Bank of Nevada County. If you have any questions, want to make donations or would like to volunteer, please contact Frank Bloksberg at (530) 273-2727.